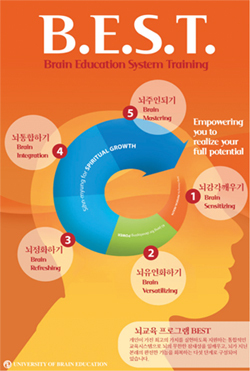 The academic field of Brain Integration, which first started in Korea for the first time in the world, is the nation's only major which teaches the principles and methods of brain education through the understanding and usage of our brain which is the 21st century future value of human kind. We are running our courses in order for students to obtain the Brain Trainer license by preparing them with theoretical and practical knowledge. Our courses provide various practical methods which allow the student to utilize their brains together with the theoretical studies so after graduating they will be able to be active brain utilization experts in all work fields. With cooperation from the International Brain Education Association, we are operating internships for overseas brain education practices in order to train globally talented individuals who possess a global mindset.